Phase 3 of the action potential occurs as the L-type calcium current dissipates, and the membrane potential is predominantly repolarized by fast and slow components of the delayed rectifier potassium current. KCNQ1 is the channel responsible for the slow component (IKs) and was also the first protein linked to the long QT syndrome: LQT1 (Kass and Moss 2006; Moss and Kass 2005). The channel is thought to exist as a complex of four pore-forming KCNQ1 monomers (each with six transmembrane domains and a pore-forming region) and at least two accessory KCNE1 subunits that confer slower activation/deactivation kinetics, rightward shift of voltage-dependent activation, and increase in conductance. 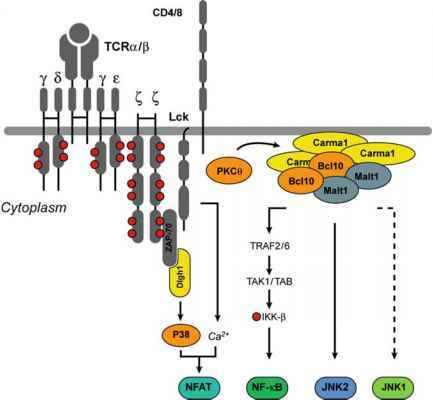 Sympathetic stimulation of P-AR slows deactivation and causes a leftward shift in the voltage-dependent activation of IKs through PKA phosphorylation of N-terminal S27 proximal to the first transmembrane domain of KCNQ1 (Kurokawa et al. 2003). Yotiao is an AKAP that binds to a C-terminal LIZ in KCNQ1 and forms the scaffold of a macromolecular complex that colocalizes protein phos-phatase 1 (PP1) and PKA in another example of bidirectional regulation (Marx et al. 2002) (Fig. 2). A naturally occurring mutation within the KCNQ1 LIZ motif (G589D) is associated with reduced PKA-mediated regulation of KCNQ1 (Marx et al. 2002). Pharmacologic PAR blockade confers a survival benefit in KCNQ1-associated long QT syndrome variants versus those with LQT3 (SCN5A mutations) (Priori et al. 2004).